In retrospect, overarching MMO plotlines can sound like supervillain whack-a-mole. The Galactic Republic and Sith Empire might be at war, but together they’ve bopped the Hutt Cartel’s invasion of Makeb on the head, and given the Dread Masters of Oricon a good malleting. For now, though, Star Wars: The Old Republic’s next major storyline is swathed in mystery, preceded by two new flashpoints that make up its prelude. It might be time to take another look at Star Wars: The Old Republic. 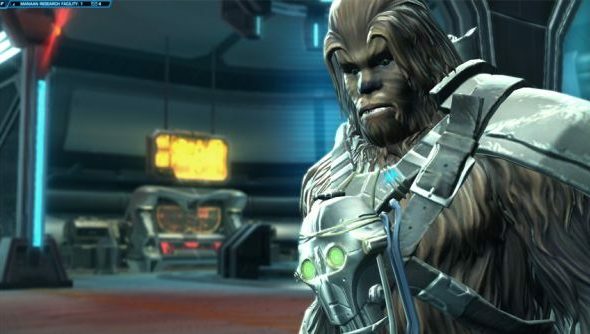 The first chapter of SWTOR’s story for 2014, Forged Alliances Part I, constitutes two flashpoints named Assault on Tython and Korriban Incursion. You’ll see them already in Group Finder, but lead writer Charles Boyd suggests you’d be better off first finding the A7-M1 droid on Vaiken Spacedock or the T3-G2 on Carrick Station. That way you can begin the story embedded in SWTOR’s game world. Part I will usher in some important new allies, and allude heavily to the central mystery that’ll come to dominate the storyline – that mole waiting to be thwacked. Forged Alliances will be a three-part story, leading directly into the game’s next expansion. Plenty aren’t, according to a report a few days ago that pinned The Old Republic’s earnings at $165m in 2013. Are you paying into BioWare’s survivor MMO?